All 12 of the stadiums hosting 2014 World Cup matches will be either new or completely renovated, and a recently passed Brazilian law requires that at least one percent of their capacity be devoted to seats for fans with disabilities, including obesity. 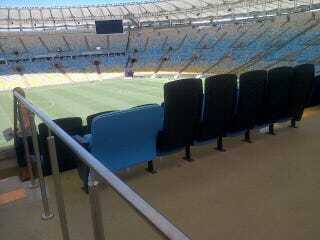 Above is an extra-wide seat at Rio de Janeiro's Maracanã Stadium, where Bloomberg News sports reporter Tariq Panja is getting a tour today. He snapped the shot, and notes that obese fans will be entitled to a 50 percent discount on match tickets. Obesity in Brazil is a major problem, and the rate is growing rapidly. But these special seats won't just be available to locals. Fans from around the world can apply, but must have a body mass index of 30 or higher, and be able to prove it with a note from their doctor.